Originally a member of Gorilla Grodd's Secret Society, Giganta gains great strength when she uses her powers to grow to superhuman size. When Gorilla Grodd reformed his gang into the Legion of Doom, Giganta followed, becoming a key member in his army of villains. We've already covered Wonder Woman's lack of a marketable rogues gallery, back in the Circe review (one of my earliest reviews, in fact), but there's one name quite a few people do know: Giganta. Mind you, her fame is mostly just the result of having been drafted into Challenge of the Super Friends' Legion of Doom because turning into a giant is a nice easy superpower to animate, and they were short on women (and since she was there just to give Apache Chief someone to pretend to fight, not a lot of people twigged that she was originally a Wonder Woman rogue anyway). Let's be honest, though, she probably wouldn't have made it into this line if Mattel hadn't had to keep asking "Okay, who else have we got who's taller than average? "; supervillainesses get the worst of pro-male, pro-hero character merchandise trends. Giganta was the Collect-And-whatever for DCU Series 8 - the last one for a while that actually had any kind of presence hereabouts, even if it was just at the comicshop for a day or two until they sold out. Actual toy stores? Keep dreaming. Gentleman Ghost got the head (and hips), Commander Steel had the main torso, the legs were with Vigilante and Mr. Terrific, and Doctor Fate and the Parademon had the arms (though thanks to the generosity of our dear readers I didn't have to bother with those last two). 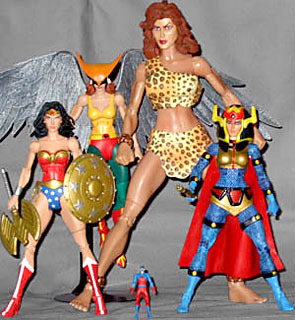 Hawkgirl came with a base which may have been intended for Giganta - it didn't do Hawkgirl any good - but more on that later. Gather all the bits up, assemble them while forgetting to take a photo before the figure's irrevocably in one piece, et voila, a really ticked off Wilma Flintstone. Now, Giganta (real name Dr. Doris Zuel, a nod to her Golden Age creator Professor Zool - nowadays there is no Professor, only Zuel... oh shut up, it's funny and you know it) is known mainly for two things: giant size, and dressing like a stripper with a circus strongman theme. Her figure does both... kind of. 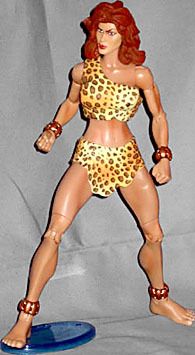 Barring a bit of odd articulation (of which more later) she looks the part, with a well-formed body, not overly muscular but certainly not fragile, skimpily crammed into a leopard-skin miniskirt and one-shoulder crop top, plus the weird but traditional bracelets and anklets. Mattel haven't noticeably skimped anywhere, going to the trouble of giving the costume a subtle fur texture beneath its painted pattern - which features shading between orange and yellow, besides the dark-outlined spots - as well as sculpted and painted stitching, creating a very credible rendition of the costume that stands up well beside more complex modern hero outfits. Her skin is for the most part cast in colour, smooth and tanned, but like the costume there's no cost-cutting, with painted fingernails and toenails, and a decent paint job on the copper bracelets/anklets, with dark brown underlying the metallic top coat to give it volume. So she looks good, but that's in isolation. The thing is, she's 10" tall, and while yes that's more than enough to let her see over the heads of regular DCU figures at the cinema, it's just not gigantic. I know the true giant of the comicbook world aren't ever going to turn up in scale - even in the big-BAF heyday of ToyBiz, Galactus still had to settle for being moderately imposing - and it's arguably a better choice to go with a slightly giant BAF Giganta than just give up and do a "not using her powers" regular figure, but... she's not gigantic, and accepting that, economically, this is the best we can get doesn't change the fact that Wonder Woman comes up to her abdomen, rather than her ankle. It's kind of like making a toy of the Human Torch - whatever you do, he's not going to look like a guy actually made of flame. Anyway, her face - regardless of size - is one of those ones that's love-or-hate, since it's sporting a very distinct expression, and furthermore that expression is a bit... odd. It's an appropriately ill-wishing scowl, sure, but something about it just seems more like it'd be at home on Desperate Housewives than in an attempt to murder one of the world's greatest champions (not that the housewives don't get up to some shenanigans themselves) - it doesn't seem really evil, so much as just irritated. That said, it's rendered very nicely, with delicate paint apps including gentle skin shading around the eyes. Her hair is a healthy chestnut, but lacking any real attempt to highlight with paints - the sculpt is very defined by itself, so it doesn't look monotonous, but that definition, and the depth required for it, makes the hair as a whole look weirdly voluminous. It's like she's just stepped out of an all-day marathon makeover at the giant-sized hair salon. Articulation is mostly what you'd expect from DCU, just scaled up, but there are a few quirks. Given the skirt covering her hips, she gets full swivel/pin/swivel balljoints, rather than the more visually appealing DCU-standard swivel/pins; can't see 'em, no reason to care what they look like. Oddly though, she still has the thigh swivel joints, just above her knees - with the swivel already a feature of the hips that's pointless, and only serves to mar the appearance of her legs (and, presumably, save Mattel a bit of effort making one-piece thighs). While we're on the thighs, I found them unusually loose at the peg where they attach to the crotch piece - her ankles tend to have a bit of give in their pin joint too, which combined means she's a potential shelf-diver, not a happy situation for a figure this heavy. Otherwise everything's fairly standard: balljoint neck (restricted by the hair), swivel sternum (no pin joint there), swivel/pin/swivel shoulders, pin elbows, swivel wrists, the aforementioned hips and thighs, pin knees, and swivel/pin ankles. Twisting ankles would've theoretically been a real help to posing, although given the existing joint problems, throwing one more area of potential weakness into the mix may have done more harm than good. Despite being an accessory herself, Giganta gets a couple of bits and pieces to keep her company, packaged with various of her component figures. The display base included with Hawkgirl is of some use, since the peg holes in her feet are the same size as on regular-sized figures - it's only large enough for one foot, making it not especially aesthetically satisfying so far as bases go, but it helps hold her up. There's also the mini-Atom, included with Gentleman Ghost - the only DCU figure that she really looks gigantic in comparison to, if you assume he's not using his shrinking power at the same time. So there we have it - the first proper BAF I've built (not including little ones like the Star Wars droids; the Doctor Who Giant Robot came later, I've just been dawdling writing this review), and she's... alright. Her physique is a bit above the average for DCU ladies, being not completely generic, but overall she's just what I expect from the range - good enough as a representation of the character, good-looking face, but nothing outstanding.